Paul Kagame speaking at the UN General Assembly in 2015. Image credit Cia Pak via Flickr (CC). At the start of March 2019, Anselme Mutuyimana, the spokesperson of the United Democratic Forces of Rwanda (FDU-Inkingi), an opposition coalition, was found dead in Gishwati National Forest. At 30 years old, his death is tragic, yet unsurprising. Mutuyimana’s death comes just three months after the acquittal of Diane Rwigara—the 2017 would-be presidential candidate and outspoken critic of Rwanda’s President Paul Kagame—and her mother, Adeline, of what the three-judge Kigali High Court bench called the “baseless” charges of inciting insurrection and forging endorsement signatures. Though their family’s substantial assets were auctioned off before they were granted bail in October, the drop of the Prosecutor General’s appeal in January seemed to signal to the world that Rwanda was finally ready to accept not only opposition but true gender parity in politics. Though in January, it appeared as if she would be the last, Rwigara was certainly not the first opposition figure to face persecution during President Kagame’s tenure. Seven years earlier, another female presidential candidate and the leader of FDU-Inkingi, Victoire Ingabire, was sentenced to a 15-year prison term on similar charges. Ingabire had formed FDU-Inkingi in exile in 2006. She served over eight years of that sentence before being released, along with 2,100 other prisoners, in September, 2018. At the time of her release, Ingabire said it marked “the beginning of the opening of political space in Rwanda.” Given the fate of her spokesperson, perhaps she spoke too soon. Mutuyimana’s death marks the continuation of an almost decade-long pattern of mysterious disappearances and deaths, as well as arrests, torture, and imprisonment of numerous opposition figures and journalists. Just a month before the 2010 Rwandan presidential elections, Andre Rwisereka, leader of Rwanda’s Democratic Green Party and presidential candidate, was discovered near Butare with his head almost completely severed. That same year former Lieutenant general Kayumba Nyamwasa was shot in the stomach in Johannesburg, South Africa; he survived. The journalist investigating the attempted assassination, however, was killed in Kigali several days later. New Year’s Day, 2014: Patrick Karegeya, former head of intelligence in Rwanda, was found strangled in his hotel room in Johannesburg; he had been living in exile since 2007, after being jailed twice in his home country. May 2017, FDU member Jean Damascene Habarugira, was summoned to a meeting with security officials. Several days later, his family was called to retrieve his body from a hospital. Just a month before the release of Victoire Ingabire, in August 2018, FDU-Inkingi Vice President Boniface Twagirimana, was arrested along with eight other party members on charges of “forming an armed group with the intent to overthrow the government of Rwanda.” Less than a month later, the Rwandan Correctional Service reported Twagirimana missing from a headcount following an unannounced transfer from one prison in Kigali to another in the southern district of Nyanza. Twagirimana is believed dead. The question of who is responsible for the precarious existence of Rwandan opposition party leaders and journalists is one that, frankly, will not have an answer any time soon. To speculate on the identity of the individual or group that shared decision-making authority regarding any of these cases is to flirt with participation in what the late Okwui Enwezor called “the disaster mongering of the Western media… that make[s] Africa seem less than a nurturing place” and which all-too-frequently creates only tragic narratives of an Africa populated exclusively by heroes and villains. Conversely, to ignore the concreteness of these abuses—either by foregoing reporting on the subject within its full context or by refusing to ask hard questions of the Kagame administration—would be to achieve a slightly different end to the same imperialistic role. The Western journalist, observer, analyst, tiptoes the line on which one side lies “disaster mongering” and on the other lies the rubber stamp of approval routinely provided by the likes of Tony Blair and Bill Gates. Rock. And hard place. Keeping this mind, it is difficult to imagine a stronger correlation than that which exists between the deaths, disappearances, and imprisonment of so many opposition party members and the re-elections of an executive who has not only been the de facto leader since 1994, but who also won the opportunity to stay in power until 2034 through a 2015 constitutional referendum that 98 percent of voters approved following a spontaneous petition signed by four million Rwandans. 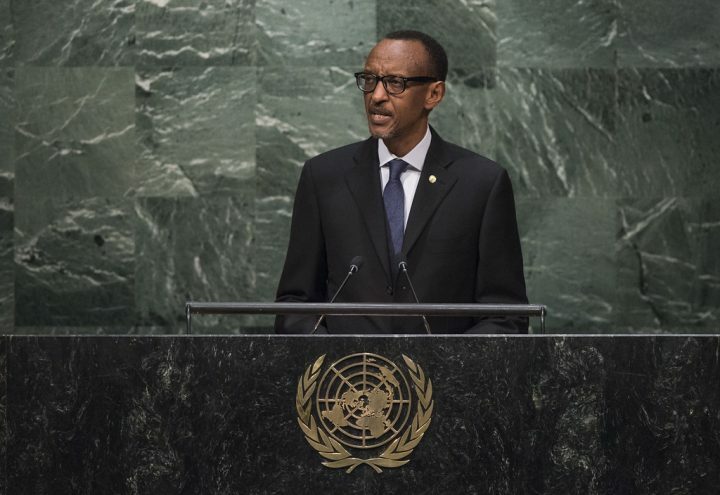 It is more difficult still to imagine a more fitting connection than that which forms between Kagame’s ominous words of warning immediately following the death of Karegeya and the recent revelation by a Johannesburg magistrate that all four suspects in his killing were Rwandan nationals. Given these details, it is difficult to resist the potentially maleficent, albeit journalistic, urge to connect certain dots despite their being viewed from a distance both geographic and cultural. When a country’s own journalists are prevented from doing their work due to arrest or worse, what then is the role, if any, of the Western/foreign journalist? Who, without the bias described by Enwezor, is left to ask hard questions, and what can be achieved by hard questions when they are posed to a politician as adept as Kagame? Critics of President Kagame are often met with derision and the well-worn and evasive argument that the West’s lack of intervention during, and even complicity in, the 1994 Genocide Against the Tutsis in Rwanda (as it is now officially recognized by the UN) invalidates any contemporary criticism. In interviews, Kagame is soft-spoken, showing frustration only when his style of rule is questioned and after which he demurely seeks an uncontroversial form of sympathy by emphasizing Rwanda’s tragic past, suggesting that he is simply doing his best, or that Rwandans understand and willingly make the sacrifices required of nation building. Whenever questions are raised through articles published online, there is sure to be a self-proclaimed Rwandan and Kagame-supporting commentator offering their two-cents on the manifold accomplishments of Rwanda under his leadership: the peace and security that the country has come to know, the unprecedented gender parity in the Rwandan Parliament, the growth of a middle class, near-universal health insurance, the numerous development projects, the consistently high GDP growth rate, etc. Kagame has been enormously successful in transforming post-genocide Rwanda. He regularly acknowledges this success in his challenge to foreign journalists and otherwise interested parties to “ask the people of Rwanda” themselves; a quixotic proposal given the context of political repression. Having personally served as a Peace Corps Volunteer in Rwanda, I can attest to Kagame’s tremendous popularity; the people love him. Whether or not it is because he has always been the only game in town, even those with no memory of the genocide love him. Which begs the question: if support for the RPF and the incumbent president is so universal and genuine, why is his government behind the frequent arrest, torture, and imprisonment of so many opposition politicians and investigative journalists? On May Day, what is there to celebrate in Africa?